Desert Rose est une maison isolée au bord de l'eau sur le domaine de 5 hectares de Monticello. Il est perché directement sur l'une des plus belles plages de l'île, célèbre pour son incroyable sable rose et ses eaux turquoises. Profitez d'une vue fantastique sur l'océan Atlantique. La grande plage Tiki Hut et le pont sont une occasion unique de profiter du paradis de très près. La brise fraîche, les eaux cristallines, les palmiers et les longues plages sont ce que vous vivrez à Monticello - Desert Rose. Desert Rose est un chalet avec deux chambres et une salle de bain. La chambre principale a un lit king et une chambre supplémentaire a un lit superposé. Toutes les chambres ont des ventilateurs de plafond et des climatiseurs séparés. Le salon dispose d'un grand canapé, d'une télévision satellite, d'un lecteur DVD et d'une chaîne stéréo. La maison dispose d'une buanderie séparée avec lave-linge et sèche-linge. La maison est idéale pour 2 à 4 personnes, mais nous pouvons également accueillir des groupes plus importants. Veuillez voir Monticello - Jardin de lumière - 6 personnes (HomeAway. / 298738). Système de cinéma maison. Hôtel Safe. Chef privé en option. Babysitter disponible. Le téléphone est pour les appels entrants et locales. Est interdit de fumer dans l'établissement. Very nice secluded cottage. Would defiantly stay again. Just what we were looking for. Only saw a handful on people. Very relaxing!! Barbra and her team were very easy to work with and communicated very well. We thoroughly enjoyed our time at the Desert Rose house! The location, privacy and beautiful beach made for a wonderful vacation. We loved this house. The location was fantastic our care-taker Andrey was so amazing and helpful. We look forward to coming back every year and staying only here. This was our third time at Desert Rose and we have decided it is our favorite house we've stayed at in our 5 years of visiting Eleuthera. Desert Rose is perfectly situated in a private setting on a glorious beach. Our favorite aspect is all of the outdoor space - from the wrap around deck to the patio with lounge chairs a little lower down the bank and then finally the beautiful beach where we relax under a palm leaf palabra. The house itself is simple with ample space for a couple or family with small children as second bedroom as bunk beds. The kitchen is well stocked for meal prep should you choose and the living area/tv room is quite spacious and comfortable. The location near Governor's Harbor is super convenient to shopping and restaurants as well as the organic farm in the other direction in Palmetto. We noticed more people (10-12/day) on the beach this time which was a disappointment. We've had stays when we saw not a soul on the beach and felt like we owned the island! 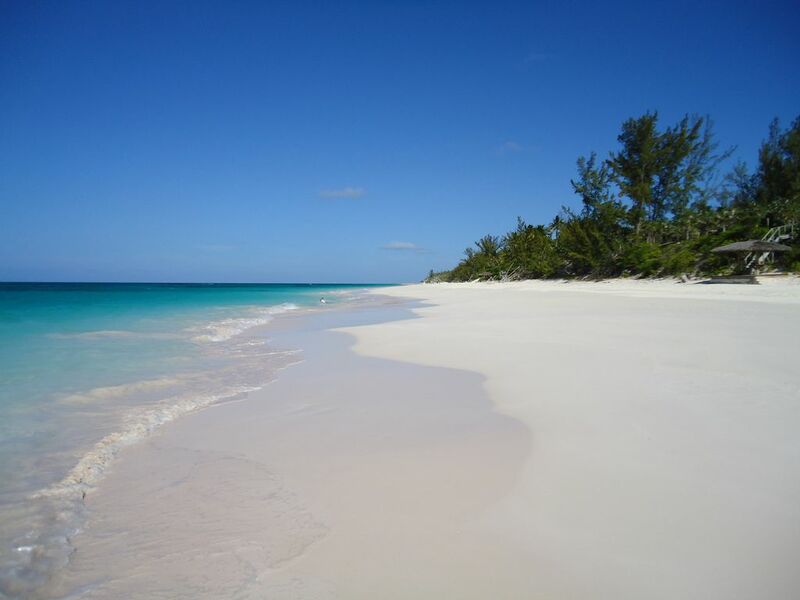 The secret of Eleuthera must be getting out. There is a second home on this property but well out of the way of Desert Rose so if people are staying there at the same time, you still feel quite secluded and private. We very much look forward to our return visit next year! Thank you Barbara! My husband and I had a fabulous 10 days exploring the beautiful island of Eleuthera and enjoying this very comfortable house. The house had everything we needed, including wifi and cable TV, grocery stores and restaurants were very close (Sunset & 1648 our favorites), although a couple were closed for renovations. The beach was beautiful and the sand was powdery soft. The house is very secluded on the beach and we only saw two other people on the beach while we were there and they were the owners of the house next door. We had a few days where the Atlantic was a bit rough which caused seaweed to wash up on shore making swimming almost impossible. On those few days when swimming was rather difficult, we explored other beaches on the island and, other than our beach at the house, our other favorite was Ten Bay Beach. There were beach chairs, snorkel gear, plenty of towels and everything you need to cook meals during your stay. The house was fully stocked. Just bring a few clothes, sunscreen and some bug spray with deet for the no see ums (only bothered us two nights because there was always a nice breeze). We loved having our coffee on the deck overlooking the beach and spent the days under the thatched hut on the beach listening to music or enjoying a good book. We rented a nice car from the property manager who works for Barbara and all went well. Working with Barbara made our vacation stress free and we had a very memorable week and plan to return at some point in the future. Excellent house and PERFECT beach! We had a wonderful week enjoying this house while celebrating our 25th anniversary. The beach was amazing. Reef just off shore and the sand was beautiful. The house had everything we needed. Grocery stores are close. Restaurants are close. The AC was good. There's a covered area out back with a big table and grill. Beach chairs, snorkel gear.....you need to bring a few clothes, sunscreen, deet and food. This was our fifth trip to Eleuthera and we have never seen a better stocked house. Thank you so much for all the extras you provide for your guests! We had a very memorable week and plan to return. This would be a great house to bring our grandkids to at some point. La propriété Monticello est située sur la côte atlantique, connue comme la Riviera des Bahamas. Nous sommes dans un domaine fermé et privé de 5 acres mais à seulement quelques minutes des restaurants principaux. C'est un excellent quartier, sûr et très calme. La plage de sable rose est longue, presque toujours déserte et offre toutes sortes de lieux de baignade, vous ne trouverez généralement personne d'autre que vous-même. Vous pouvez profiter d'une eau cristalline peu profonde et calme, qui convient parfaitement aux nageurs. Les amateurs de plongée en apnée trouveront beaucoup à faire pour les garder dans la mer turquoise. Governor's Harbour est à environ 10 min / 3. 5 miles de distance. Vous y trouverez des épiceries, des banques, des boutiques de cadeaux, des magasins de plongée et plus encore. Pour plus d'informations s'il vous plaît visitez notre site Web ci-dessous sous Détails supplémentaires. Rates are based on 2 guests. Additional guest $250/wk. ( Max 4) Refundable Damage deposit $500 Holydays: ( 2 guests) $1,960/wk - (4 guests) $2,460/wk Christmas and New Year's week: ( 2 guests) $1,995/wk, (4 guests) $2,495/wk RATES 2019: $270 per night, Weekly $1,890/7 nights. For stays less than one week, please add $15 per night, for 5 days or less, please add $25 per night. For payments via CC, 3% Credit card transaction fee is already included in the rate. For International payments via CC, an extra 2% surcharge fee will be added to the rate. Alternative payments accepted (US$ personal checks and Bank transfers) and discounts will be applied.